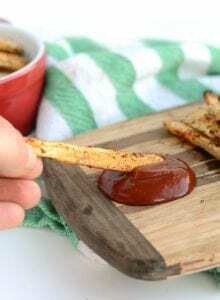 These Chili Garlic Baked Parsnip Fries make a fun and healthy snack or side to a healthy veggie burger or sandwich. They’re high in fibre, low in fat and carbs and have a slightly sweet yet salty and spicy flavour. Peel the parsnips and trim off the tops and ends. Slice into fries, keeping them as consistently-sized as possible for best results. Add them to a bowl with the olive oil and spices and toss to combine. Spread the fries on the baking sheets in one layer. Do not overlap. Bake for 20-25 minutes, flip the fries then bake for another 10-12 minutes until lightly browned, tender but crispy. Be careful not to burn. I’ve had best results using parchment paper for baking these.Purchase here.